It’s been a bit longer than we had planned, but my wife, Aileen, has returned with a new vegetarian review. She promises to be better about reporting in the new year, but comes to us today with one of her favorite meals on property! Let’s see what she has for us to taste today! Hello Main Street Gazette readers! 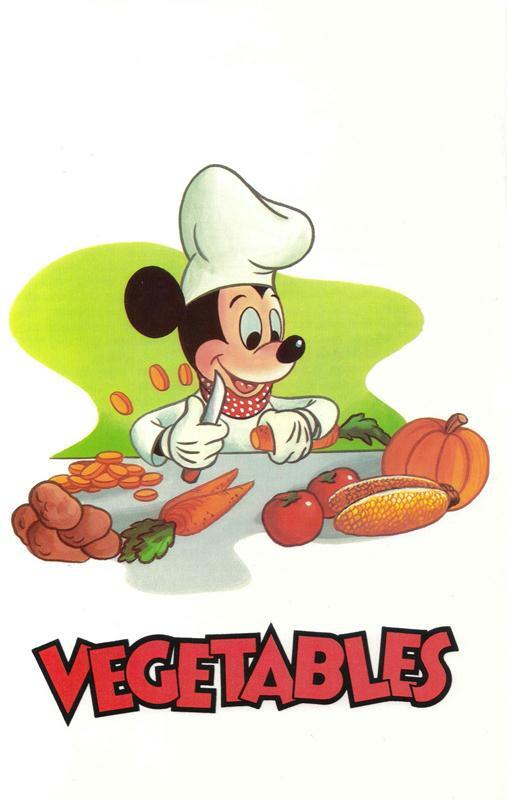 I am back to talk about another tasty vegetarian item from Epcot’s World Showcase. 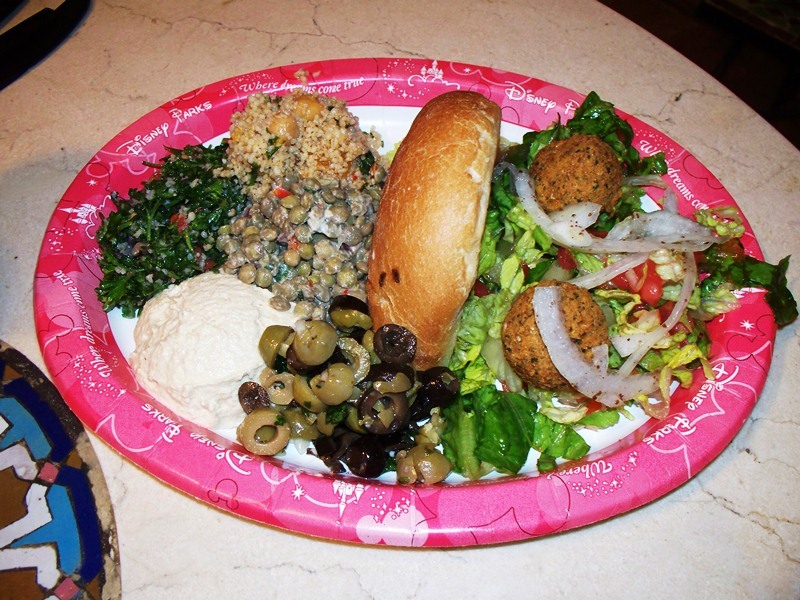 Today we will sink our teeth into the unique vegetable platter from the Tangierine Café in the Morocco Pavilion. It is a sampler platter that is big on flavor but not on cost, coming in at $10.99 for the meal. The platter itself consists of a number cold salads, hummus, falafel, Moroccan bread and marinated olives. For those not familiar with Moroccan and/or Mediterranean food, having a myriad of flavors and textures is typical for a meal and this platter is no exception. The variety provided on this plate makes it wholly satisfying and in all honesty, I didn’t even notice I was eating a meal without meat. So, let’s begin with a description of each part of this platter. First, you receive 2 falafels, which are deep fried balls of mashed chick peas along with a number of spices served on top of a green salad. Personally, I love falafels and if you have never tried them before, I think this is fairly good example of what they should taste like. There is a good amount of crunch from the frying and a moist center with just the right amount of spice. The best comparison to another food item would be that falafels are the Mediterranean version of hush puppies. Next, let’s move on to the couscous salad. Couscous is another item that many of you may have never tried, but I think you should take the opportunity to give it a whirl. It is basically a cross between rice and pasta and absorbs whatever spices and flavors you add to it. This specific salad has spices such as cinnamon and nutmeg, parsley, red and green peppers, red onion, zucchini, raisins and chick peas mixed into it. I know that seems like a lot of ingredients but it has a light and fresh flavor that does not disappoint. 3rd on our list is the lentil salad. Lentils are also a staple of Mediterranean and Moroccan cuisine and this salad is a different way to enjoy this type of bean. It is mixed with red and green peppers and mayonnaise. The salad itself has a great texture and is extremely filling, which makes it a great addition to this platter. Tabouleh is next on our tour. This may also be a traditional item you have never tried. Tabouleh is made up of tons of parsley, onion, mint, tomato and bulgur (a dried cracked wheat) and dressed with olive oil and lemon juice. I personally enjoy tabouleh and think it is a great addition to this dish but if you are not a fan of parsley, you may want to skip this particular item as it plays a very large role in the flavor and texture of the salad. The last items on the plate are hummus, marinated olives and Moroccan bread. In my opinion, the best of these is the marinated olives. There is a mixture of black and green olives along with spices, oil and vinegar. I think the salty, briny flavor of the olives is a great accompaniment to the rest of the items on this plate. As for the hummus, the only word I have to describe it is average. It is traditional hummus with a hint of lemon and while there is slight flavor to it, it definitely left me feeling as if it was missing something it its execution. In comparison to the other items, which are bursting at the seams with flavor, the hummus left me wanting so much more. Finally, we come to the bread. This is the only item on the plate that I could have done without. While I love bread and I feel it is integral to this type of sampler platter, the Moroccan bread was slightly dry and definitely less flavorful than I would have liked. My suggestion is to use the bread to eat the hummus or the other salads, but definitely do not eat it on its own. So, the final verdict? 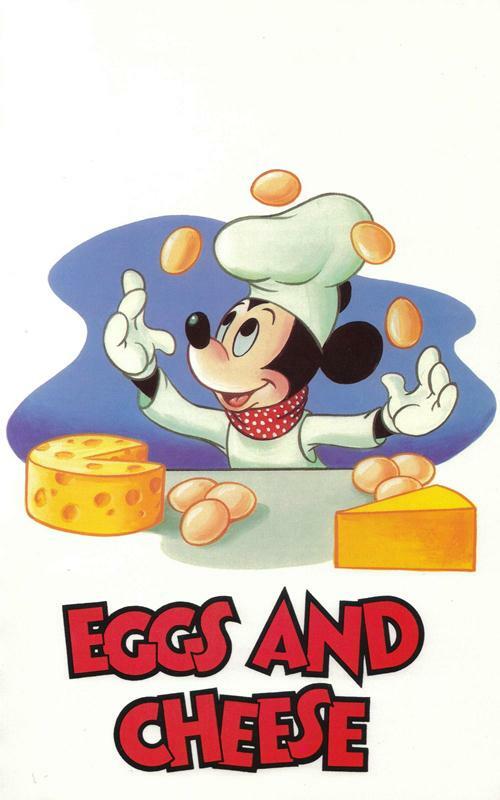 This is by far one of my favorite quick service meals on Walt Disney World property (with or without meat). In fact, I love it so much make sure I have it at least once during a trip. 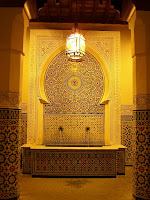 It is a great menu option if you are looking for something with a wide variety of flavors and textures and I think it is an amazing way to experience the food of Morocco and the Mediterranean without breaking the bank. Please give it a try the next time you are looking for a new and interesting quick service option in World Showcase. This is one of those rare photographs that I fell in love with as soon as I came across it. 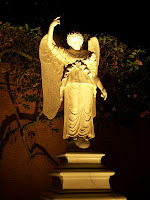 What’s so special about this picture, come explore with me and I’ll do the best I can to make you love it too. For starters, we are in Tampa Ship in 1970, the location where the Nautili submarines for 20,000 Leagues Under the Sea Submarine Voyage were built. 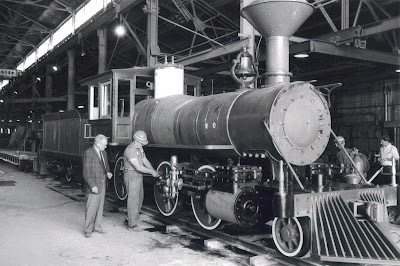 As is apparent here, it was also the only company in central Florida with the proper heavy machinery and spacing required to work with full sized locomotives. The gentleman in the coat and tie is Earl Vilmer. Vilmer had been with Disneyland for a number of years, but had been brought in as Walt Disney World’s Transportation Superintendent, and charged with the construction of the Magic Kingdom’s railway and renovation of the engines for the Walt Disney World Railroad. Which brings us to the engine itself. Found along the Yucatan Peninsula in Merida, Mexico by Vilmer and Roger Broggie, the locomotive was a Baldwin 2-6-0 “Mogul”-type. Originally built it September of 1928, the engine was in such a state of disrepair when it came to Tampa Ship that workers were provided with color photographs of the Disneyland trains to enthuse them. The engine has come a long way from when it was found, including the 85 pound brass bell that has already been attached, but this rusty, forty-two year old locomotive had a long way to go. Through sweat, blood and tears, the abandoned engine would finally be transformed into the lush green Engine No. 2, otherwise known as the Lilly Belle, named for Walt Disney wife. It may look different here, still under renovation and without its lantern or final paint job, but this is a moment in time with a legendary railman, in a storied structure, and an engine that has brought joy to innumerable guests. It gives me shivers to see such a gorgeous piece of Magic Kingdom at such a critical juncture in its career! We are smack dab in the middle of the holidays. Here in the States, we’ve just passed Thanksgiving on and are in the fast lane on the way towards Christmas and New Years’. With the days getting shorter, and the temperatures starting to dip, this is, without a doubt, a season of food. More specifically warm foods that fill us up and block against the cold. And what does this better, than something sweet from the bakery case? That’s just the question the roundtable had to contend with this month! Roundtable Topic: Where do you go for your favorite baked goods in Walt Disney World? What do you pick up? And why? Roundtable Contributors: Elizabeth Caran (Take the Monorail), Melissa Loflin (Makin’ Memories), AJ Wolfe (The Disney Food Blog), Andy Jackson (Eating (and Drinking) around the World), and yours truly. 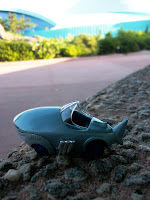 Elizabeth – The more I visit Walt Disney World with other fans, the more I realize my trips lack routine in many ways. The consumption of baked goods is one of those ways. Don't get me wrong... I do love a baked good or two. 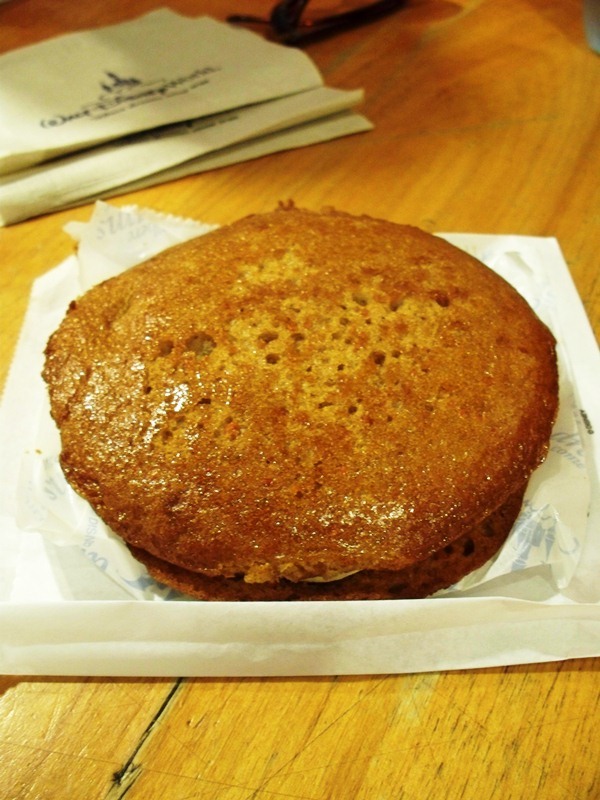 If there is a single treat (and bake shop) that I enjoy more consistently than any other, it's the famous carrot cake cookie from The Writer's Stop. But believe it or not, I don't get one every time. 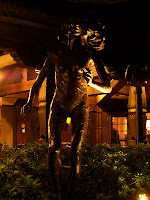 I prefer to go with the flow at Disney and stop when I am hungry (or at least craving a sweet). This freedom means that if I see something I really want to try, I haven't just gorged myself at the last place I passed and I am able to try it. 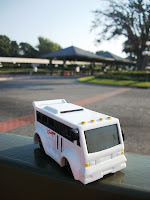 One of the great features of Walt Disney World is there is always something new to try. My first visit to the bake shop in Norway was only about a year ago, shockingly, and I suspect it will quickly become my new favorite place for baked goods. Well, at least until something else catches me by the sweet tooth! Melissa – If I were my husband, my answer would be short and sweet. There's nothing he loves more than a chocolate muffin from the food courts. Me, however, I need something more. Now that I've discovered the carrot cake cookie I must stop at the Writer's Stop on every trip to The Studios to have one and a coffee for my oh so nutritious breakfast. I love to sit up front by the window and people watch while I enjoy my treat. As a carrot cake lover, this cookie, made of two carrot cake pieces with cream cheese in the middle is a little taste of pure goodness that can be enjoyed in a nice quiet location. 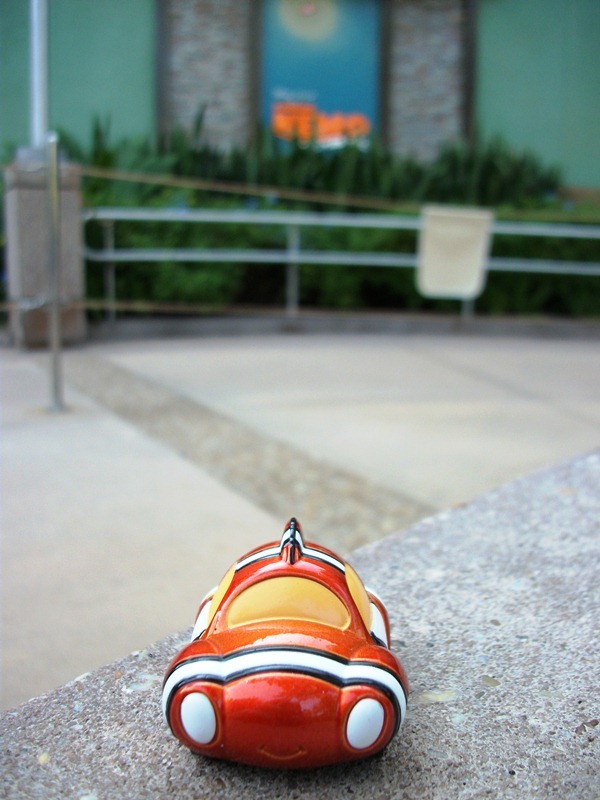 AJ – There are SO many wonderful places to get unique and delicious baked goods in Disney World... 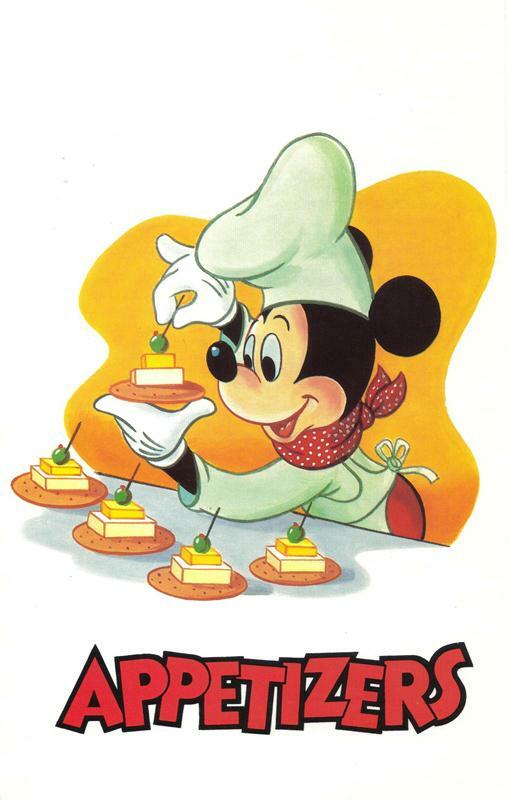 Boardwalk Bakery is always trying out new cupcakes and offering 100% unique items like the Mickey head cake (Funfetti cake! Chocolate glaze! White chocolate Mickey face!) and the cheesecake brownie; Main Street Bakery has those ginormous cinnamon rolls – and they'll pile on even more of the extra melty, creamy glaze if you can overcome your shame and ask for it (not a problem); Boulangerie Patisserie in Epcot's France offers sweet and savory pastries – you never know what you're going to get when you go in there, but leaving with an overstuffed eclair is never a disappointment; Karamelle Küche in Epcot's Germany puts together some incredible caramel cookies and brownies – heavenly – and the cupcakes!! ; Kringla Bakeri og Cafe always has me in a quandry over luscious school bread, sweet pretzels, or cloudberry horns; Writer's Stop will always get my vote for the cream cheese frosting-filled carrot cake cookie; but what about Starring Rolls Cafe, the place that debuted the legendary butterfinger cupcake??? 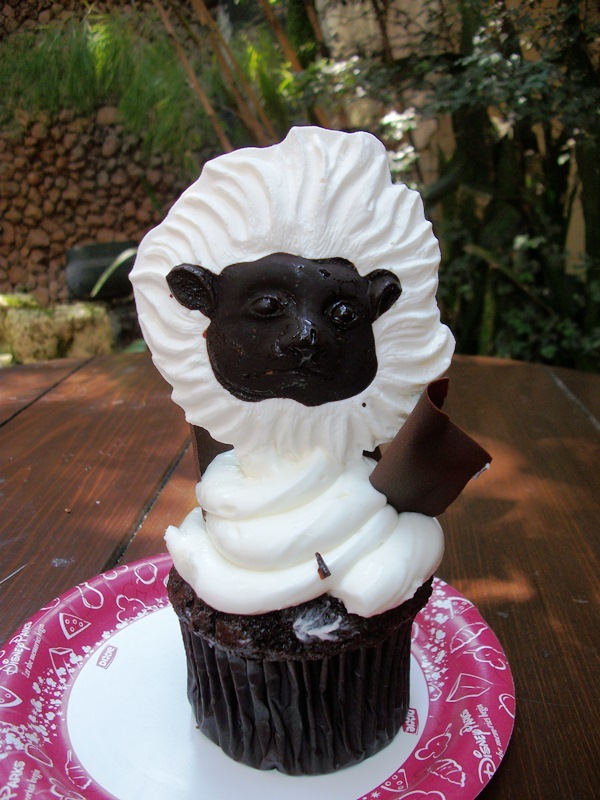 And you can't forget Kusafiri Bakery in the Animal Kingdom, where the animal-themed treats have taken on cult status over the past year. 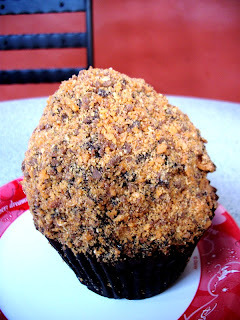 I guess if I have to pick only ONE location and ONE baked good, I'll have to go with my heart and choose the Butterfinger Cupcake at Starring Rolls Cafe in DHS. The truth is that I want to lock myself away with that cupcake every time I see it. It's like my own little dream come true. Chocolate cake filled with chocolate ganache, lardy buttercream frosting piled high on top, more chocolate ganache hugging the buttercream, and a generous coating of butterfinger crumbs smooshed into the whole thing. HOW is that not HEAVEN? Where do I go? 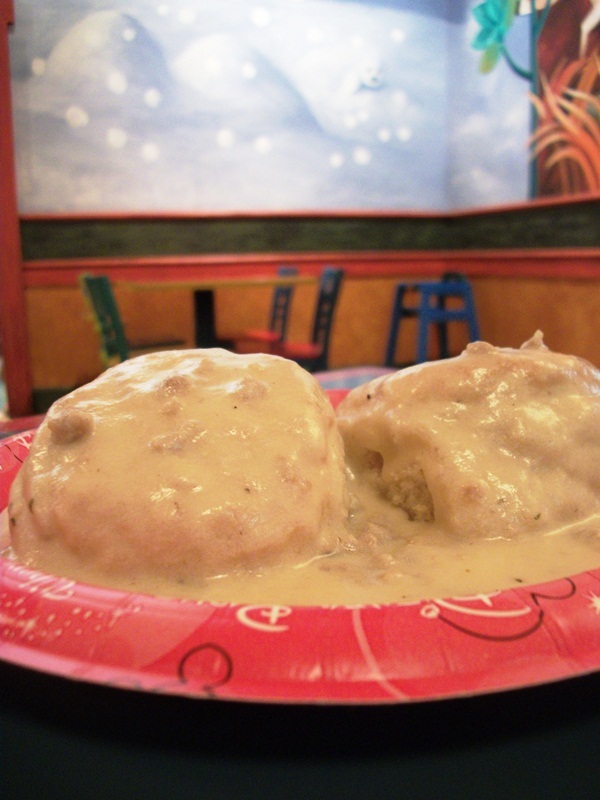 Well if I’m staying at one of the All-Star resorts or Port Orleans French Quarter, I head to the quick-service area for breakfast and order up the Biscuits and Gravy. As hard it is for a true Southern Boy to admit, Disney bakes up a darn good biscuit – top that with a fatty can’t-possibly-be-much-worse-for-your-arteries slathering of oh-so-tasty sausage gravy and you have a rib-sticking plate of goodness. Add a generous amount of black pepper and some drops of hot sauce and I’m a happy, happy boy. To try and keep my girlish figure, I don’t eat such gravy goodness often, and that’s why I save it as a special treat while at the World. 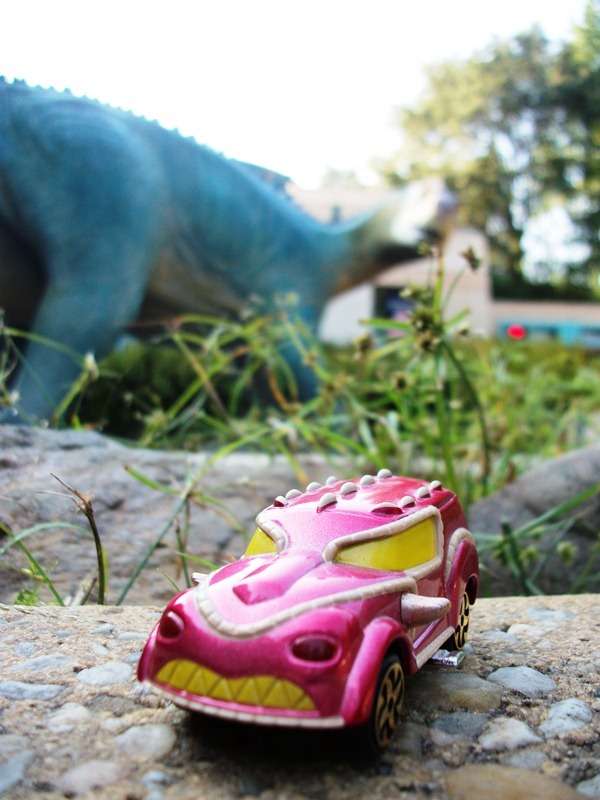 It’s a filling and tasty way to start a full day of park touring, and it also doesn’t hurt that it’s under four bucks! Ryan – The easy answer here is the Boulangerie Patisserie, isn’t it? I mean, we all know I get my hopes up every trip for some raspberry schuss and, failing that, resort to any number of the other readily available sweets. Honestly, though, it isn’t the place I think of immediately for gathering baked goods, it is simply a nice park pit stop. Same goes for Kusafiri, Main Street Bakery, and Starring Rolls. They are all a nice place to stop back, especially for a morning sugar fix, but they aren’t the best thing since sliced bread for, well, sliced bread. 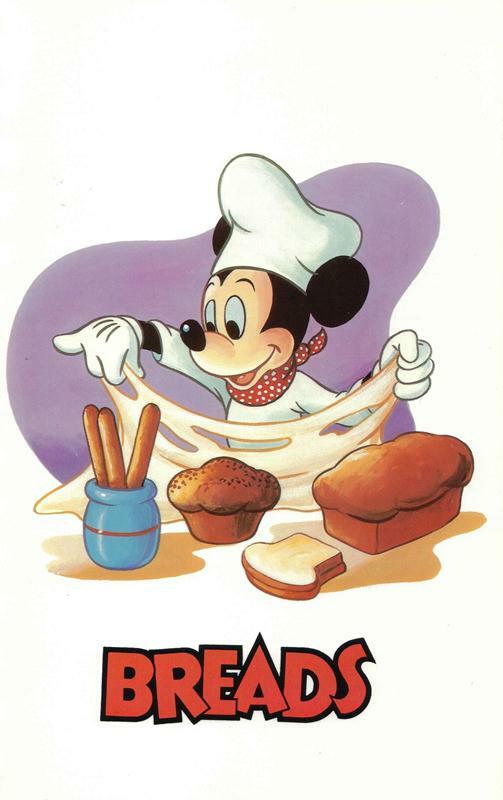 Okay, so I’m not going to find freshly baked sliced bread anywhere on property, but you get the picture. 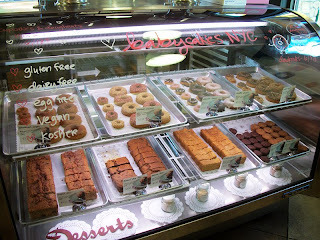 The bakery I make a point at stopping for these days is BabyCakesNYC at Downtown Disney Marketplace. 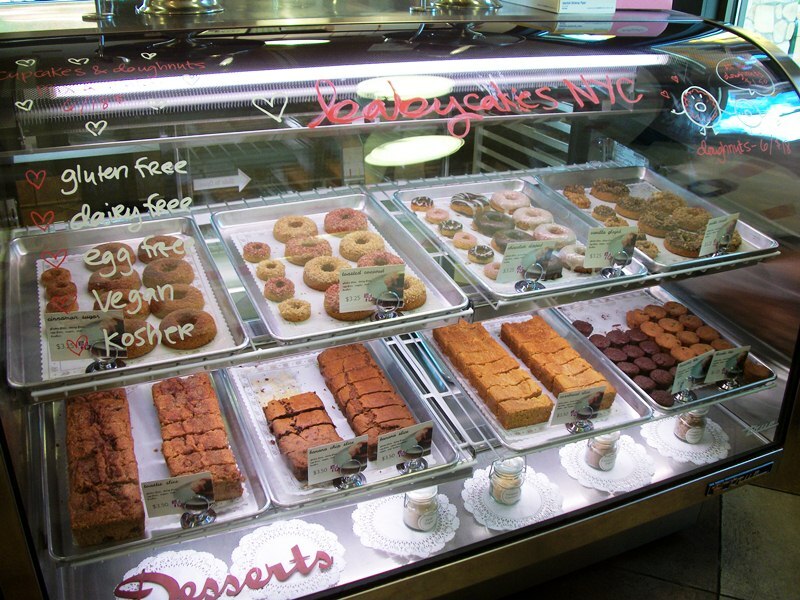 There are a variety of baked goods here, from cupcakes and cookies to doughnuts and loaves of sweet breads, which come in a remarkable assortment of ridiculously delicious flavors! This is where I come when I want to stock up the resort room with morning treats or late night snacks. The baked goods take into consideration a number of dietary restrictions, and yet still manage to taste just as bad for you as any other confection on property! More importantly, with a family member who is hypoglycemic, the agave sweetened cupcakes, brownies and loaves means she’s able to partake in the delicious treats just as much as the rest of us. I’ve said it before, and I’ll say it again, if you have not yet tried BabyCakesNYC at Downtown Disney Marketplace, you need to. You will not be disappointed! As you can tell from the short list of responses, a lot of the roundtable had a hard time crawling away from the Thanksgiving feasts last week… not that I blame them! That simply means we really want to know where you find your favorite baked goods in Walt Disney World, and what are they?!?! Passport to Dreams Old & New and FoxxFur presents an in depth look at Walt Disney World park maps of the 1970s. Jeff Heimbuch is hanging out over at This Happy Place, and he brings along Mickey’s video games history. Progress City, U.S.A. and Michael Crawford has uncovered the television special The Muppets at Walt Disney World. You still need a review of The Muppets that convinces you to go see it? Suzannah DiMarzio gives you her thoughts at Zannaland, and I couldn’t have said it better myself! AJ Wolfe presented a recipe this week that has captivated the baker in my house, head on over to The Disney Food Blog to check out the Pumpkin Biscuits with Spiced Candied Walnuts. Pumpkin Mousse, do I need to say more? 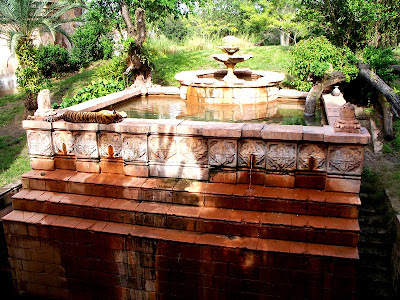 You can find it over at Eating WDW in an article from Sarah Holodick. Andy Jackson covers the world of food from the last weekend of Food & Wine to the Festival of the Masters at Eating (and Drinking) around the World. 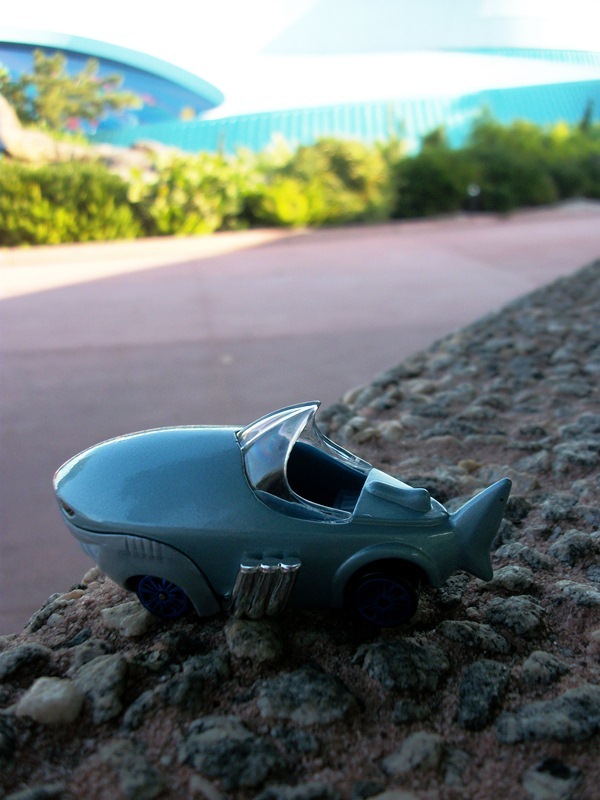 We get a base-covering list of Walt Disney World pet peeves courtesy of D.J. Jones and The World of Deej. Jennifer Fickley-Baker has a wonderful breakdown of Mickey balloons in the Macy’s Thanksgiving Day Parade for the Disney Parks Blog. 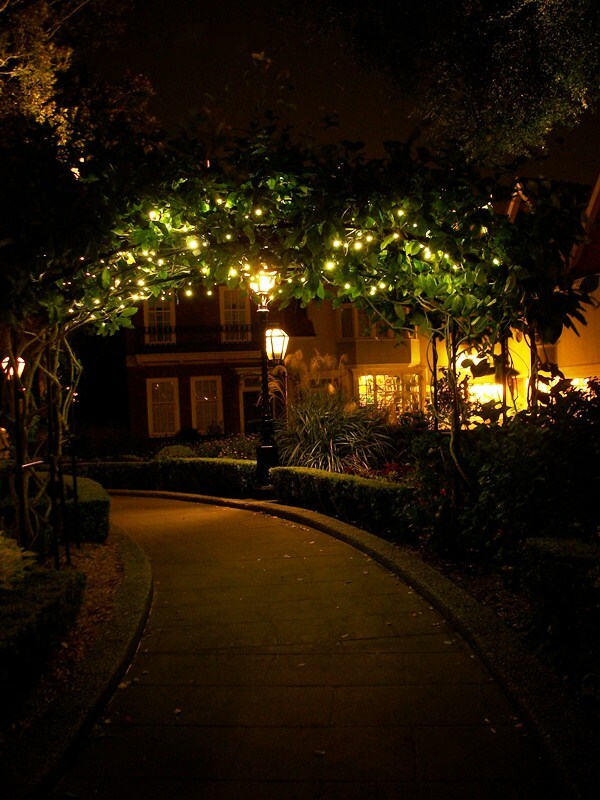 We get a reminder from the Ghost of Epcot Christmas Past, Melissa Loflin, who highlights the Lights of Winter at Makin’ Memories. 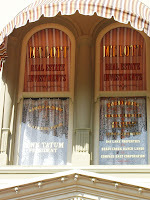 Names have a power in Walt Disney World, whether you notice them or not. 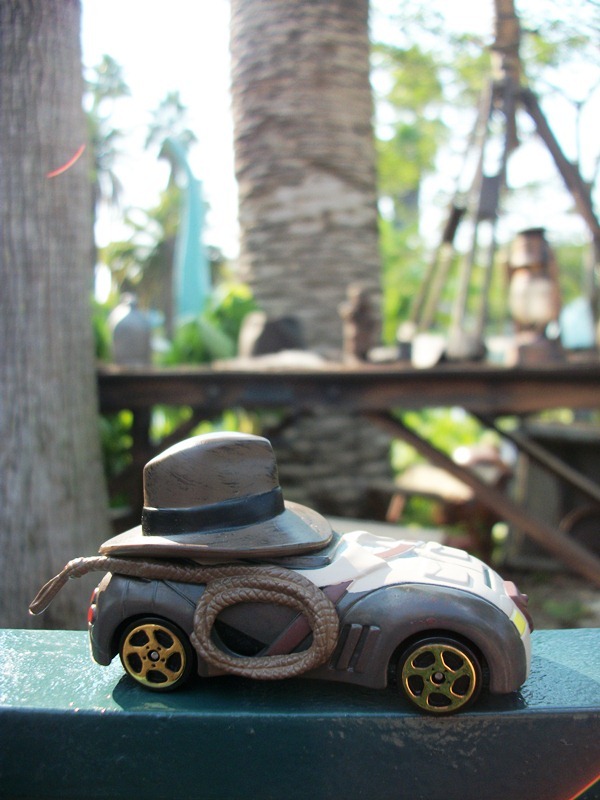 They lend an authenticity to the crates and cargo found from Frontierland to Tomorrowland and they pay respect to the individuals who have helped shape the Vacation Kingdom. Sometimes, however, a well-crafted name is as historically significant as it is hysterical. 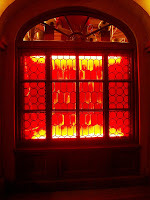 Take, for instance, this window on Main Street, U.S.A. credited to M. T. Lott and Donn Tatum. Donn Tatum was Roy’s right-hand man and started with the company in 1956 and would rise as high as chairman within the company. 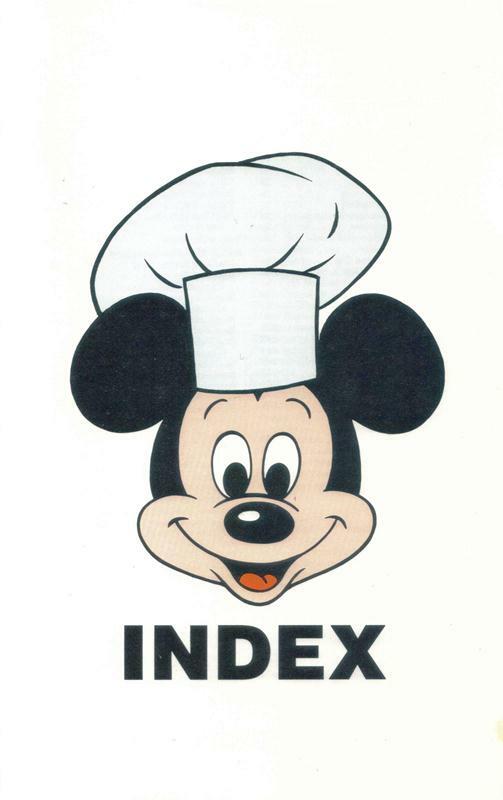 During the exploration process into what would become Walt Disney World, Tatum was tasked to evaluate the financial standing of the cities the Disney group were considering as possible sites for the new resort area. The real story in this window, however, comes from M. T. Lott and its subsidiaries: Tomahawk Properties, Latin American Development, Ayefour Corporation, Bay Lake Properties, Reedy Creek Ranch Lands and Compass East Corporation. 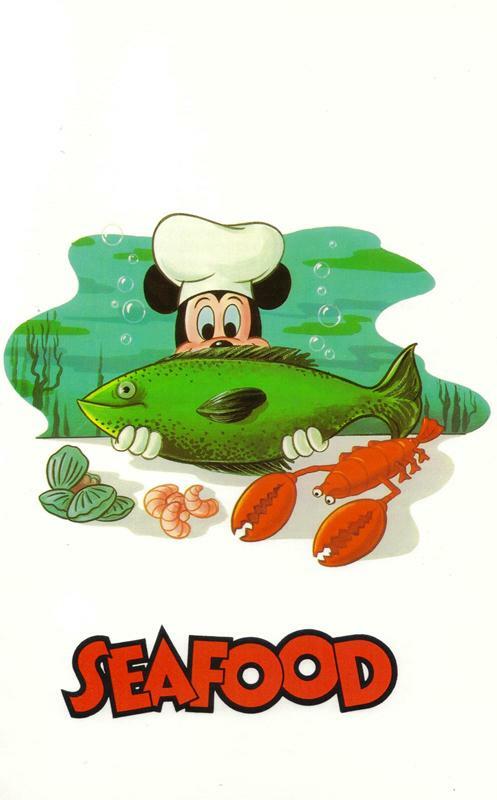 As you may have put together, Bay Lake and Reedy Creek are fairly recognizable names to Walt Disney World guests by this point in time. Along with the rest, these were the dummy companies used to purchase the land that would become Walt Disney World. The cleverest of the names belonged to Ayefour, as in I-4 the interstate running along the boundary of Walt Disney World. So, where does M. T. Lott come into play? So there you have it, they story behind the holdings of M. T. Lott. And in case you haven’t caught on to the joke by now, say ‘M. T. Lott’ out loud a couple of times, I’m sure you’ll get the picture! Today is the biggest shopping day of the year. In the blitz and craze that is the sprint to grab those dirt cheap big ticket items, let’s not forget the little things that will make those eyes light up just as big as a widescreen television! You know what I’m talking about, the stocking stuffers or little everyday gifts that will be enjoyed all year round. 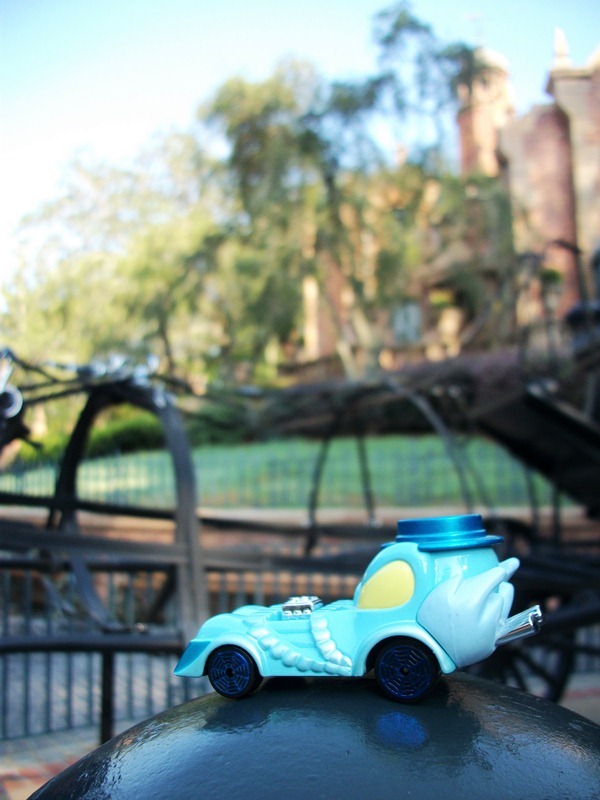 We talked about these last year, but I thought it would be nice to revisit the Disney Racers. 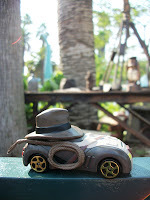 The Racers are a set of 1/64 scale die cast model cars. 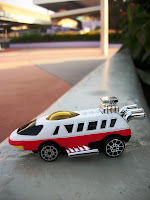 As of the end of 2010 there were eighty vehicles in the set, including a subset of Star Wars inspired vehicles. But these aren’t your ordinary flame-stripped Camaros or souped-up Mustangs, no sir! 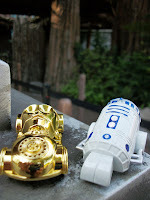 These miniature race cars have been influenced by Disney and Star Wars characters and vehicles. Just check out the 2010 poster that featured every single Disney Racer to have been released up to that point. 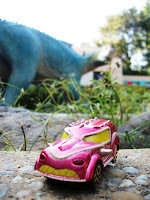 Now, I should warn you that collecting the Racers can become addictive, and some Racers are only available for a limited time, or in special packages (such as Woody, who is only available through a Toy Story four pack of cars). 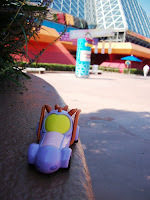 I myself have been taking part in an exhaustive search for a Chernabog and Steamboat Willie, among others. 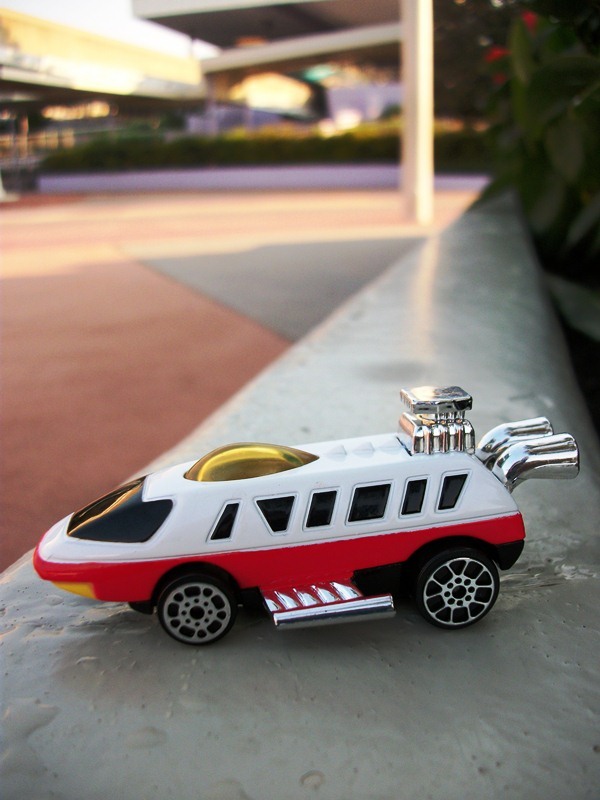 But just imagine the look of your young padawan when he uncovers a Darth Vader car or your child of the future unwrapping a monorail speedster?!?! 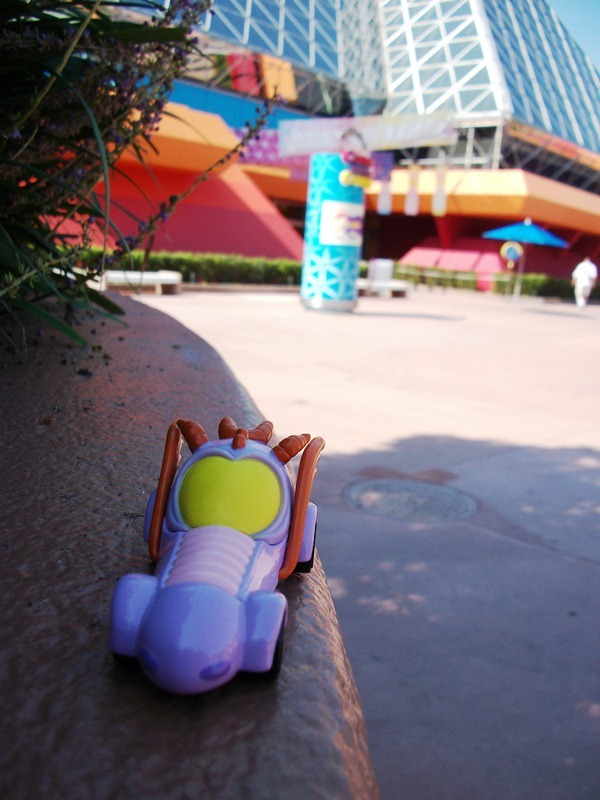 With these thoughts in mind, and my own personal fascination with taking photographs of Disney merchandise in appropriate park settings, I thought it’d be nice to show off a portion of the Disney Racers in the locales that inspired them! Since my honeymoon, one of my favorite pastimes has become taking part in wine tastings or, if at a restaurant, sampling a new wine flight. There are a variety of ways to take advantage of the cellars of Walt Disney World, but can you really go wrong with a flight accompanying a delicious meal in a Signature Dining location? 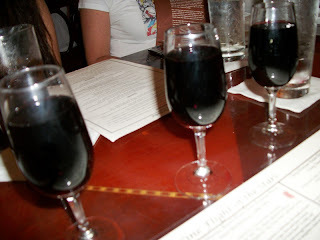 I think not, and as evidence I offer up the Red Wine Flight of the Stars, found on the menu at The Brown Derby. The flight is among several available at The Brown Derby, including a Taste of California flight and a Disney Legends Flight. I opted for the Red Wine Flight of the Stars for two reasons. One, if the stars shine brightest in Hollywood, who wouldn’t want a taste of that. And two, they had me at Marilyn Merlot. The current flight includes three 2-oz pours, one each of the 2008 Marilyn Merlot (Napa Valley), 2008 MacMurray Ranch Pinot Noir (Sonoma Coast), and 2007 Greg Norman Estate Shiraz (Australia). When the flight arrives, it comes paired with a laminated chart. Each segment is tied to one of the three wines and features accomplishments of the individual actor or celebrity, a copy of the wine’s label, a history of the vineyard and tasting notes on the specific wine. My palate isn’t nearly as complex as those who professionally rate wines, but I feel that gives me a little more insight into the average wine taster’s preferences. So, how did I rate the individual wines? 2008 Marilyn Merlot – There was a fullness to the flavor of this wine that I wasn’t expecting, and the taste really hung around on the front of my tongue. It had a fruity, almost apple hint to it. As a general rule, I am not a fan of Merlots, however, this one was excellent and my favorite of the flight. 2008 MacMurray Ranch Pinot Noir – Pinot Noir is a favorite of mine, however, this was seemed a bit thin to me. It was mild and warm, and I could feel a warmth to it that would be great for someone trying out Pinot Noir for the first time, but it was least favorite of the three. 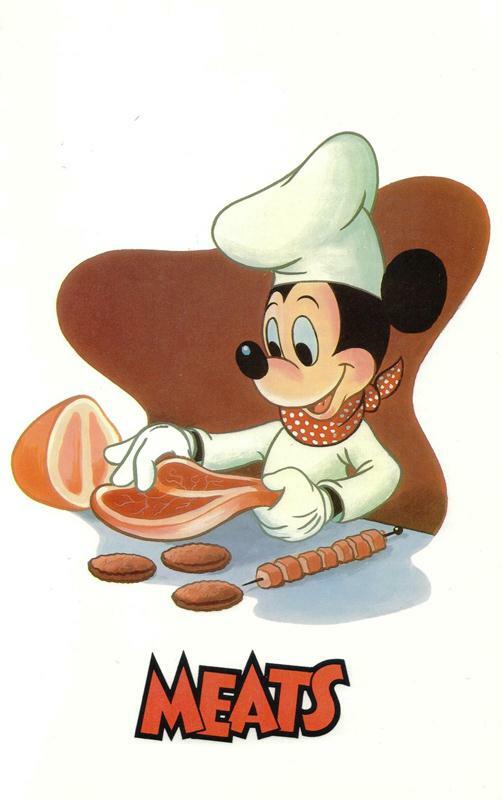 However, MacMurrary Ranch is featured in all three spots of the Disney Legends Flight, which makes me think this was not, perhaps, the vineyard’s finest offering. 2007 Greg Norman Estate Shiraz – While not ranked as high as the Marilyn Merlot, this Shiraz is a great wine, and it was a tough call. The notes I scribbled down the first time I tried this wine were, “Dark, sinister bite. Up to no good. Tickles the sides of the throat and the salivary glands.” I’ve had the wine since, and I stand by this appraisal. It also happens to be the most widely available of the three, at least in my corner of North Carolina. If you are like me, then you’re probably looking for that perfect bottle of wine to go with your Thanksgiving dinner tomorrow. If you’re also like me, you’ve heard the rule of white wine with poultry enough times that it is ingrained in your culinary vernacular. However that doesn’t have to be the case. 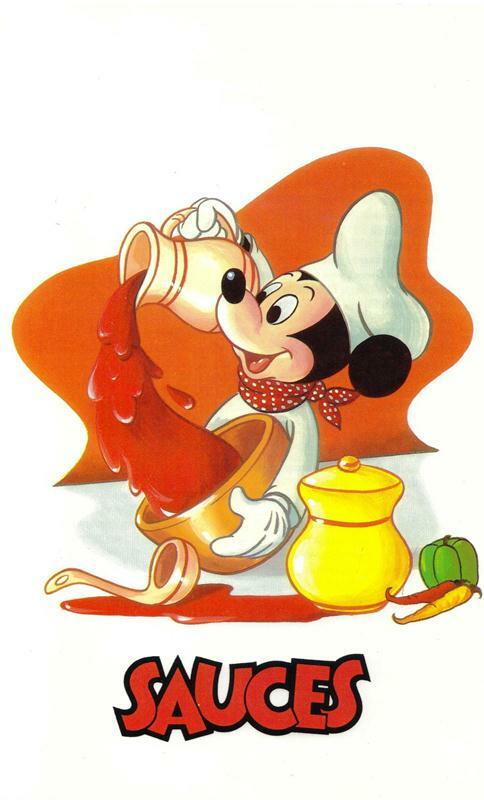 Personally, I believe any of the wines featured in the Red Wine Flight of the Stars would be perfect alongside turkey, stuffing, potatoes, and green bean casserole. For my dinner, I am bringing along the Greg Norman Shiraz, and I’m willing to bet it’ll be a smash hit! 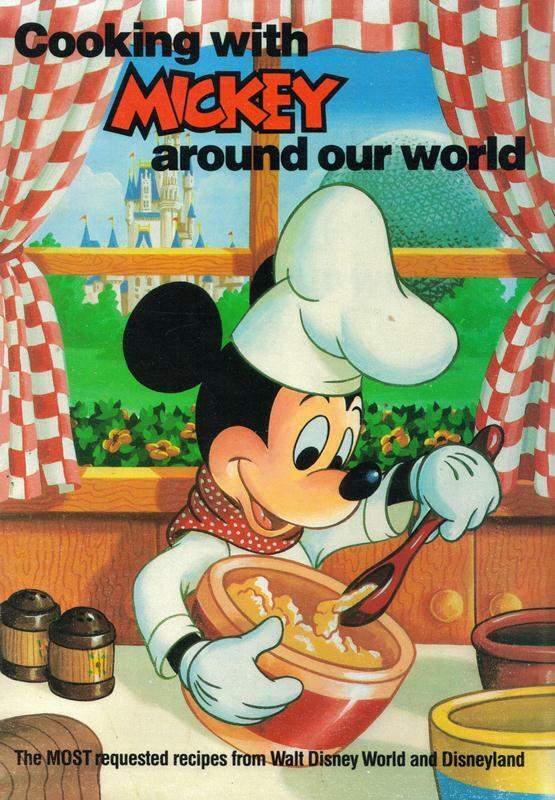 In 1986 Disney released Cooking with Mickey Around Our World, a cookbook which featured the “MOST requested recipes from Walt Disney World and Disneyland.” It has since been followed up with a smorgasbord of cookbooks featuring everything from desserts to specialty items from the Epcot International Food & Wine Festival. During one of the busiest cooking and baking periods of the year, there is no finer collection of time-tested favorites and extinct recipes! 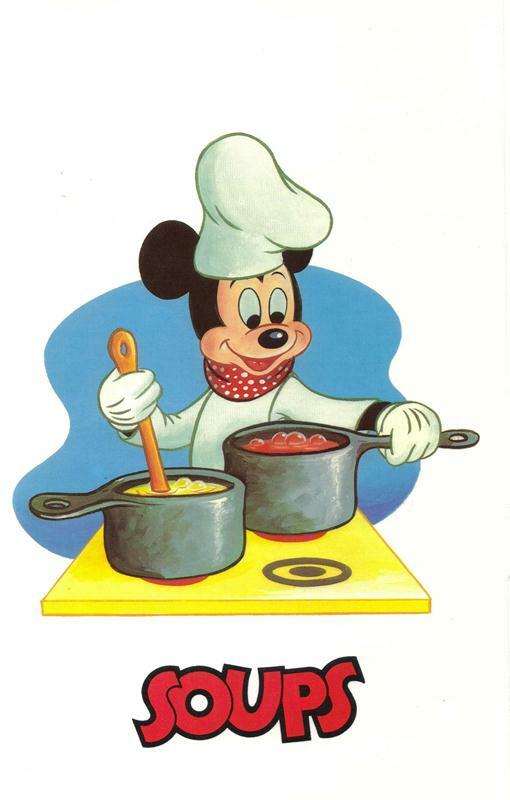 While not available in print any longer, Cooking with Mickey is easy to find in secondary markets like Ebay and Amazon, or even in used books stores (which is where I found my copy). The recipes are the stars here, and deservedly so, but that doesn’t mean the gorgeous cover and clever interior dividers should be snubbed. 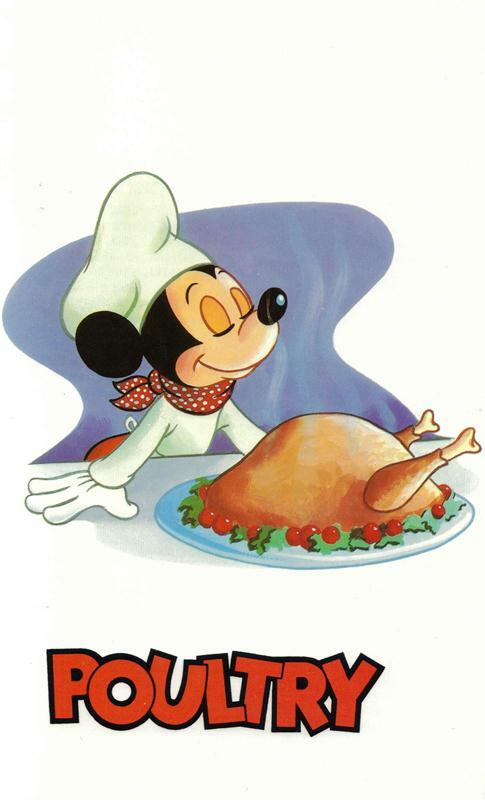 Why not print off your favorite graphic and cook along with Mickey as you prepare for Thanksgiving or your next big meal! Oh good, you’re back! Let’s take a look at it, shall we? Is there time set aside for fireworks and/or parades? 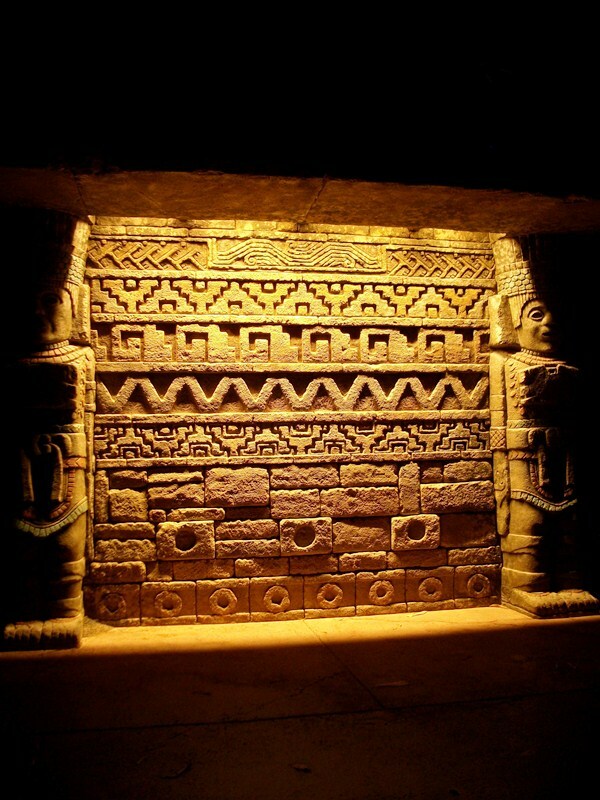 Marquee attractions are sure to be at the top of your list as well, correct? I’m willing to bet there is at least one meal on there that makes your tummy roar when you think about it, right? 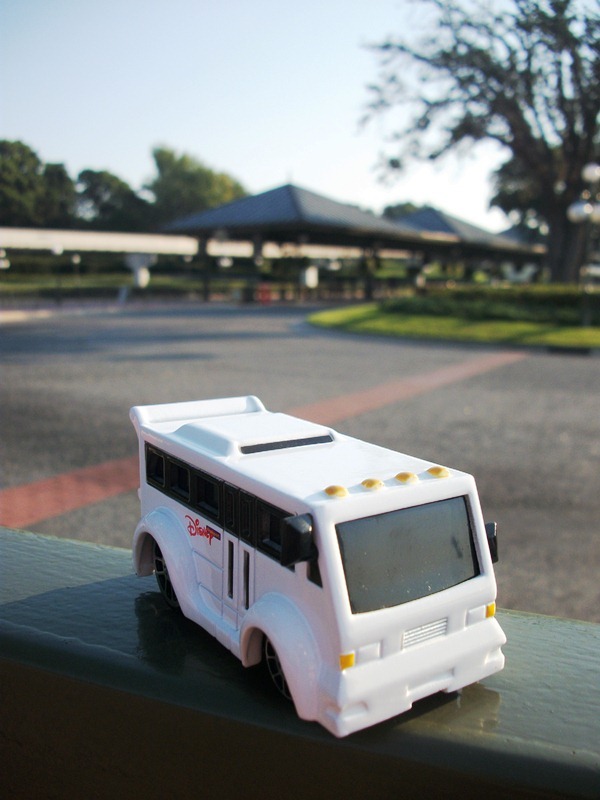 And even though they are not likely to be listed, I bet you planned ahead to set aside time for family and friend photographs, shopping, and perhaps even a trip aboard your favorite form of transportation, from monorail to motor launch, didn’t you? 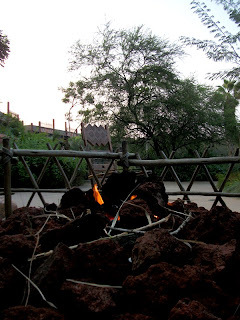 Yet, the one thing that most of us forget to schedule is time at our resorts, to take part in the recreation and unique activities provided to guests. 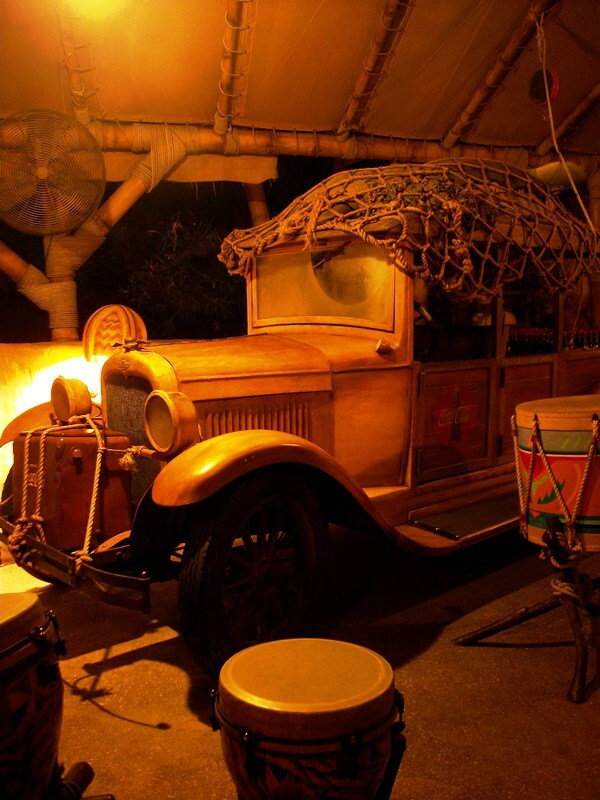 There are a ton of activities to take part in around any of the resorts, especially after the sun has set. 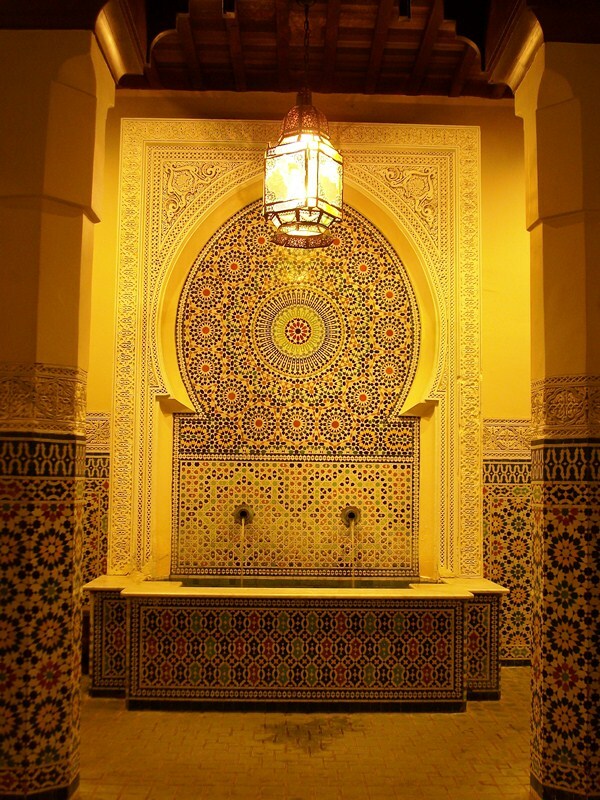 Here is a pair of our favorite evening resort activities. 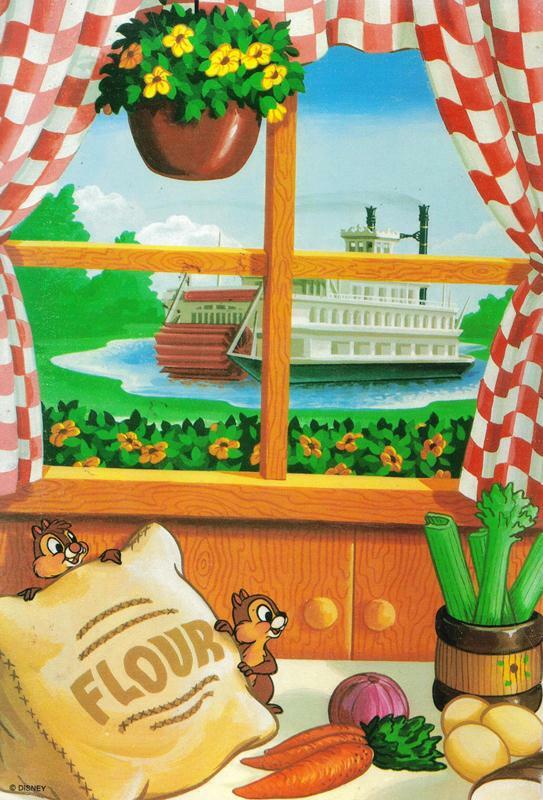 You’ve heard it on the Gazette a thousand times before, but I am a child of Fort Wilderness. 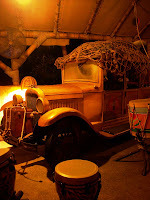 Generally, when I want to take a night off from the park-going experience, I head to Fort Wilderness for the Campfire Sing-A-Long and movie under the stars. Now, I know plenty of resorts have the inflatable screens for movies nowadays, but Fort Wilderness just feels like the real deal with its grandstand, fire pits, cover wagon, projector house and permanent movie screen. I’ve talked in depth about the experience, from Chip and Dale to the song selection, but let’s just leave it at the fact that there is no more feel good experience than hanging out with some characters, watching a childhood favorite film, with roasted marshmallows warming you up from the inside. 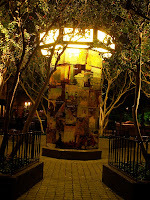 If I were not going to head for Fort Wilderness, a close second for a one of a kind evening activity is Disney’s Animal Kingdom Lodge. 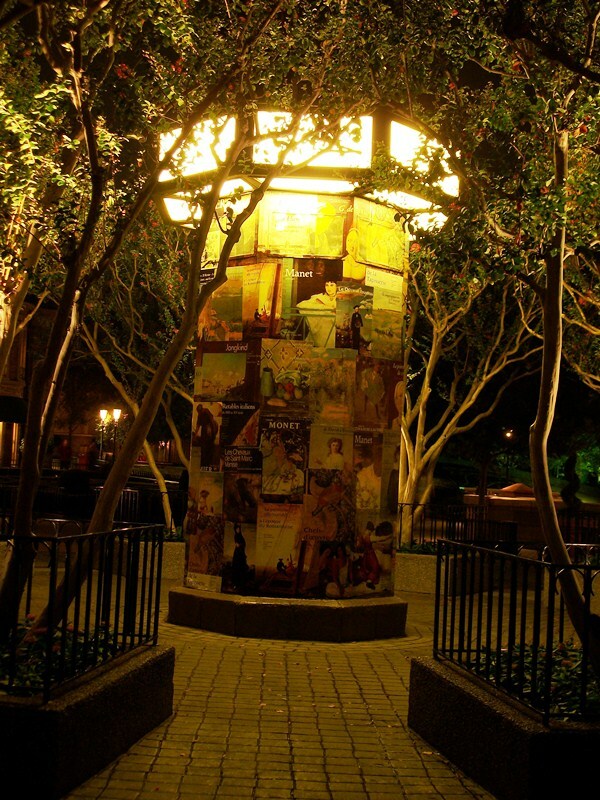 The nightly storytelling program is imbued with the same feelings as the sing-a-long at Fort Wilderness, but does it with its own unique set of standards. Set around Ogun’s Firepit at Arusha Rock, the stories are not only fascinating, but also encourage participation from the guests who choose to stop by and warm up around the fire. 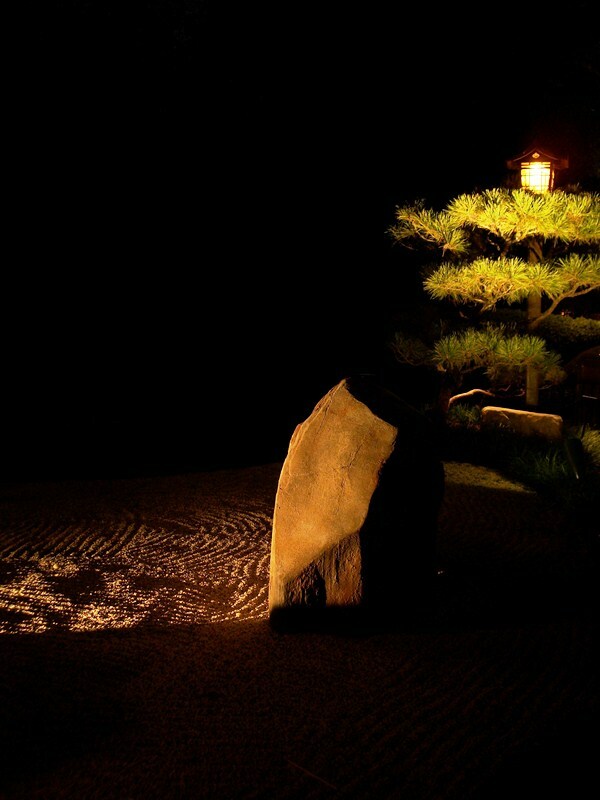 After the storytelling has wrapped up, and before returning to your room for the evening, be sure to take a moment to talk with the tellers of the tales who have much more to share with those willing to listen or venture out into the darkness to take part in some nighttime animal viewing with night-vision equipment. 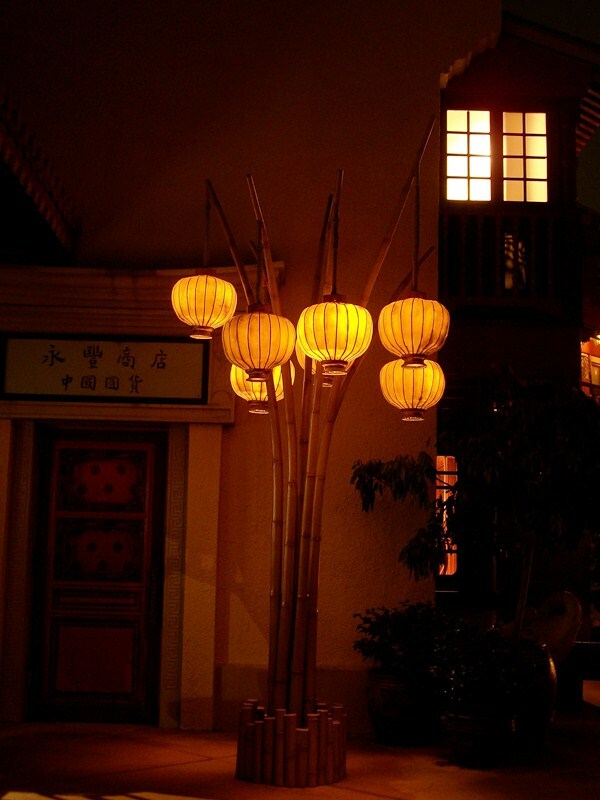 These are just a pair of the amazing activities that take place in the resorts after dark, and we haven’t even touched upon the daytime options! I hope the next time you are planning ahead for a trip to Walt Disney World you set aside just a bit of time to enjoy all that your resort has to offer, from storytelling to hula-hoop contests. The resorts offer pursuits that will create some of your most memorable moments from any trip, I can promise you that! With The Muppets only a few days out, Fritz and Imagineering Disney share a bit of Henson, the Frog, and the Street. 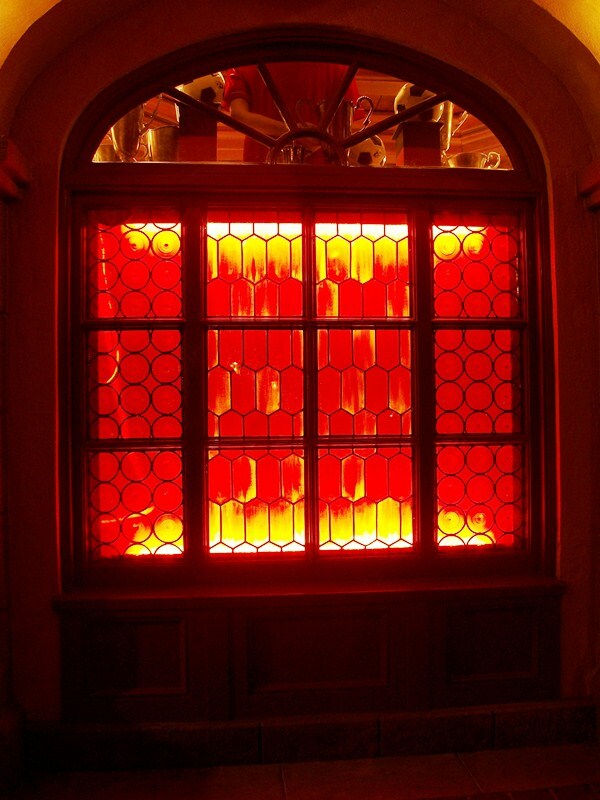 Yesterday, we featured a peek inside the Adventurers Club. 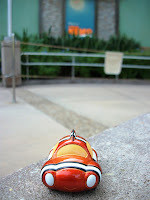 For those of you who want a taste of the club, Sarah Holodick offers up a Kungaloosh recipe at Eating WDW. 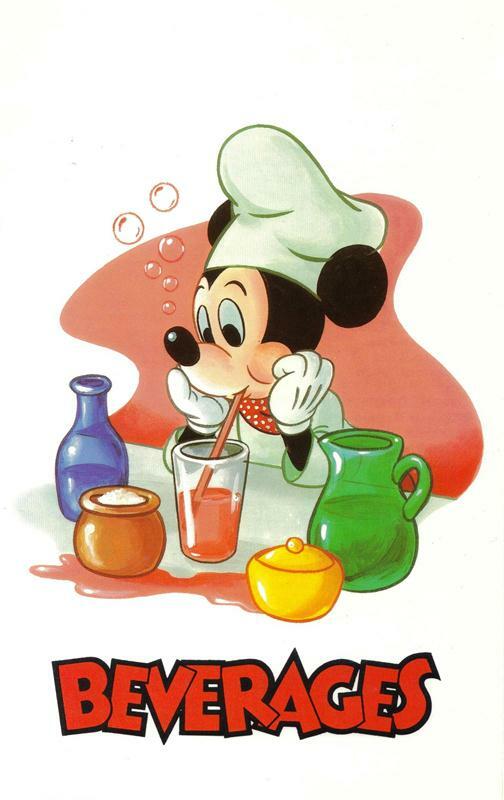 George Taylor revisits the house of Mickey Mouse to tell us what books are on Mickey’s nightstand in Imaginerding. One of my favorite part of the winter holidays at Walt Disney World are the various gingerbread displays, seen here thanks to AJ Wolfe and The Disney Food Blog. Suzannah DiMarzio continues to showcase premium food containers I must have. 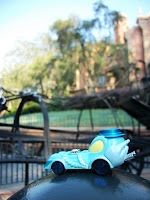 This week, Zannaland features the Dole Whip Very Merry Mug. Studios Central highlights the details of the Osborne Family Spectacle of Dancing Lights in a piece from Matt Hochberg. Makin’ Memories and Melissa Loflin reminds us that with the holidays come characters in holiday attire. The Disney Parks Blog and Jennifer Fickley-Baker take a moment to note the first new planting in Fantasyland’s expansion. 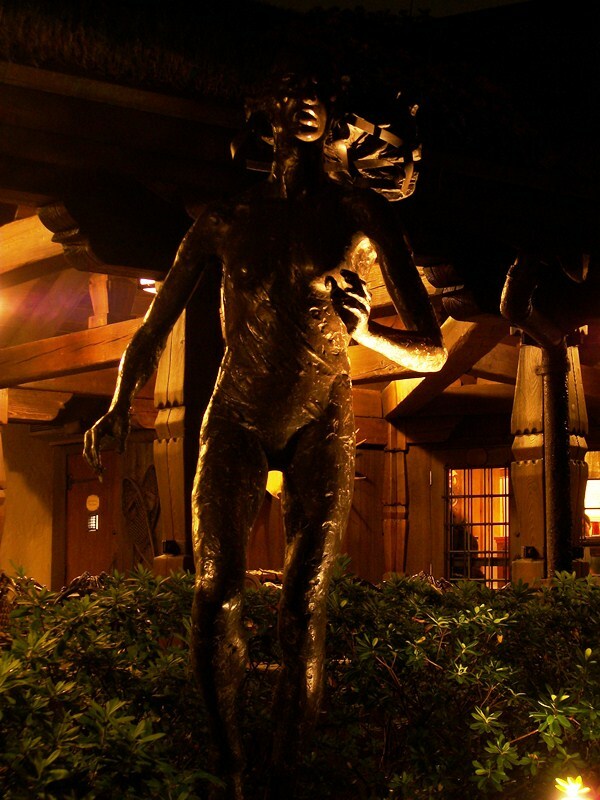 Amanda Tinney and Disney Every Day feature the work of Graham Knuttel, now permanently on display at Raglan Road. Richard returns with a Retro ’71 design for The American Adventure at DesignerLand. 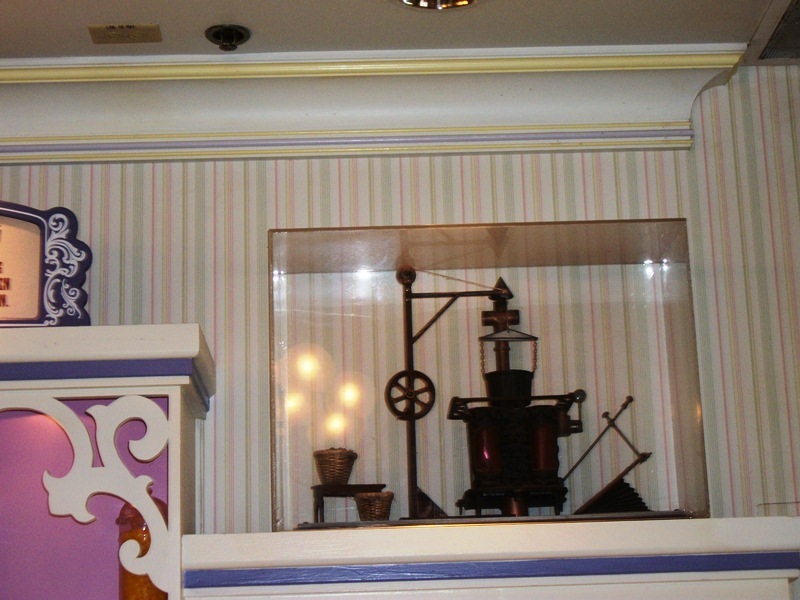 Often times, when visiting the Main Street Confectionery, guests find it very difficult to raise their eyes above the level of the sweets stacked upon the shelves or even to make eye contact as they are ordering from the refrigerated case. Yet, there is something to be said, as I often say, for looking up, down, and all around. 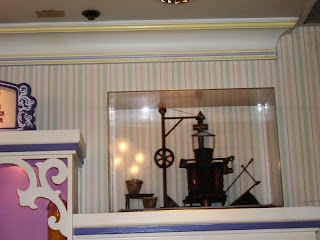 In the case of looking up, there is a mechanical system that has been rigged up to ferry the Confectionery’s goods around the shop. While it does not run as often as it once did, it does tell you that the shop’s owner is mechanically inclined and imaginative. Considering the shop is a turn-of-the-century model, this would be quite an accomplishment for a shop proprietor. As would be the two other contraptions that have been scaled down and displayed along the back wall of the shop. TOASTING – Inspired by the newfangled ironworks we saw in Chicago, I cooked up this oven to roast my cocoa beans to perfection. BREAKING AND WINNOWING – This device, of my own invention, cracks open the cocoa beans and blows away the husks, leaving only the tasty chocolate insides. While it would have been a decade removed, one would assume the Chicago mentioned is a reference to the World’s Columbian Exposition held in 1893. Also known as The Chicago World’s Fair, held in a 600 acre space that was a town unto itself, would have left a lasting impression on anyone who took in the sights and wonders of the exposition. 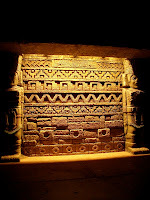 History lesson aside, and believe me I’d love to talk more about the Columbian Exposition, we’re talking chocolate here. The next time you’re in the Main Street Confectionery be sure to take a look at these windmill powered shuckers and cast iron cocoa roasters, that is once you’ve satisfied your sweet tooth! My wonderful friend Greg Grimsley has a knack for catching World Showcase in nighttime photographs that truly shows off the heart of the nighttime Epcot experience. 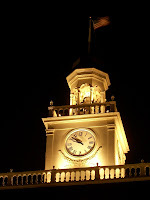 You can see all of his fine photographs, including his Disney After Dark series, at The Disney Obsession. 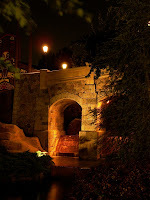 Greg was the one who first introduced me to some of the finer details and skills of taking pictures at night, so I thought I’d show off a bit of what he’s taught me. Rather than try for grand, sweeping vistas of an entire pavilion, however, I decided to go with a more subtle look at the smaller, often overlooked details at night. I hope you all enjoy this safari as much as I enjoyed creating it! Kusafiri Coffee Shop and Bakery, in the Africa section of Disney’s Animal Kingdom, has been a tucked away treat for baked goods for quite some time. These days, however, it is becoming the governing body on the treat within a treat, or two treats for the price of one, niche. The White Chocolate Elephant Cupcake, which features a white chocolate elephant lollipop atop a mountain of cupcake and frosting, has a devoted following already, but something new has been taking a run at the White Elephant in the past few months. The Cotton-Top Tamarin Cupcake was introduced in August as a part of Disney’s Animal Kingdom’s month long celebration known as, what else, Cotton-Top Tamarin Month. The festivities centered around the August 15 holiday from Columbia, South America, Day of the Cotton-Top Tamarin, and the fact that the one pound primates were returning to the Tree of Life area of the park. While the cupcake was available in multiple locations during August, Kusafiri is the only site still serving this delicious treat. The cupcake is listed as being comprised of “Chocolate Cake with Buttercream and Dark Chocolate,” but is so much more than that. Let’s start with the cake. 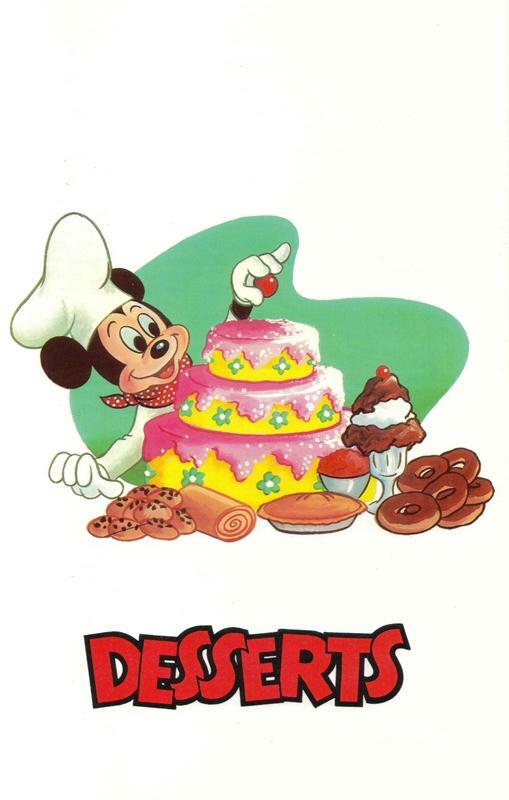 The Disney Park’s Blog listed the hefty cake portion as a dark chocolate, and while it has the richness associated with a dark chocolate cake, there is not a hint of bitterness and a lot of rich sweetness to make this cake a favorite of mine. The cake is topped with a wonderful buttercream! I hope this continues and that, as time passes, we do not find that a grainy, overly sugary frosting takes its place. The buttercream is adorned with large shavings of dark chocolate, and if you’re a fan of the shavings in a typical French silk pie, you’ll love these additions. What am I forgetting? Oh yeah, the Cotton-Top Tamarin themselves! The entire cupcake was the brainchild of Pastry Chef Andreas Born. Included in that delicious brainstorm was construction of molds for the white and dark chocolate portions of the Tamarin chocolate pop. The lollipop was great, but it is not really a have one snack now and save one for later type of deal. I shared the cupcake and lollipop with two very good friends, and we were all extremely satisfied. However, this would also be a great treat to eat either the cupcake or lollipop and give the other to a friend or family member. They’ll love you for it either way! 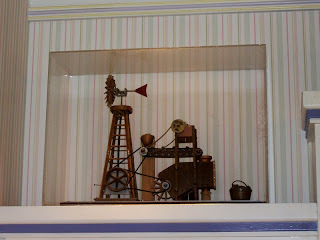 I have long been a proponent of visiting the Kusafiri window (could you imagine if the bakery actually had the space to put together a display case?!?!) for something sweet in the mornings or midafternoon. The Cotton-Top Tamarin Cupcake has only added to my conviction that more guests should be taking advantage of this sweet spot. So, what are you waiting for?